A former National Endowment for the Arts' Opera Music Theater Fellow, Mr. McCully worked with OPERA NEWS editor Patrick Smith in designing New American Works Surveys for the National Council on the Arts, and in developing dynamic peer panels with Andre Bishop, William Bolcom, Gene Boucher, Christine Bullin, Phyllis Curtin, Speight Jenkins, Ardis Krainik, Jack O' Brien, Alton Peters, Sarah Richards, Willie Anthony Waters, and Hugo Weisgall. For over a decade, he has served as a National Endowment for the Arts On-Site Evaluator of Professional Opera and Music Theater Companies and their Young Artists Training Programs for Opera Orchestra of New York, Virginia Opera, Pittsburgh Opera, Opera Carolina, Knoxville Opera, Lyric Opera of Kansas City, Tennessee Repertory Theatre, DiCapo Opera Theatre, and San Francisco Mime Troupe. A highly sought after opera adjudicator, Mr. McCully has judged numerous vocal competitions including the Metropolitan Opera National Council Auditions with the Paris Opera's artistic director Bernard Lefort, discovering now Metropolitan Opera soprano Jan Grissom; as well as, the National Opera Association's Vocal Competition with Metropolitan Opera tenor George Shirley, discovering now San Francisco Opera soprano Dana Beth Miller. Mr. McCully served as general director of the Marjorie Lawrence International Vocal Competition, with Dame Joan Sutherland and Maestro Richard Bonynge as International Honorary Chairs, at the National Museum of Women in the Arts in Washington DC, featuring Metropolitan Opera adjudicators Dominic Cossa, Mattiwilda Dobbs, Ryan Edwards, Evelyn Lear and Thomas Stewart, which discovered and launched the careers of Cristina Nassif, Chen Reiss, Michelle Gutrick, Anna Tonna, Lorraine Hinds and Charles Reid with generous financial contributions. In addition, the major discovery of Wagnerian soprano, now Lyric Opera of Chicago soprano Jennifer Wilson, at the Evelyn Lear and Thomas Stewart Master Class, at the National Museum of Women in the Arts in Washington D.C., which was documented by The New York Times. Mr. McCully served as chairman of the 43rd National Opera Association Convention in Washington DC, sponsored by Musical America, and featuring Placido Domingo, Shirley Verrett, Thomas Stewart, Evelyn Lear, William Warfield and Marni Nixon. He honored Banff Centre for their outstanding commitment to producing North American and World Premieres of New American Works at the Embassy of Canada; and presented "Lifetime Achievement Awards" to American Opera Composers Carlisle Floyd, Thea Musgrave, Robert Ward, Jack Beeson, Kirke Mechem and Seymour Barab. Mr. McCully was the recipient of an "Arts & Humanities Award" grant in Music Criticism to work with The Washington Post music critic emeritus Dr. Paul Hume. As a music director, his work in a number of Washington DC League of Theatres includes LEND ME A TENOR, GIGI, KISMET, FINIAN'S RAINBOW, SOME LIKE IT HOT, PHANTOM OF THE OPERA, as well as, DAMN YANKEES which received a Washington Theatre Awards Society's "Helen Hayes Awards" nomination for Outstanding Resident Musical. At the White House, Mr. McCully was invited to conduct the Opera Music Theater Ensemble's Emerging Artists and the Sinfonian Chorus for President William Jefferson Clinton at the State Governors Reception. In honor of the White House Bicentennial, Mr. McCully conducted his New American Work "For All These Years" from AN AMERICAN PRESIDENT. "The caliber of singers you brought to our stage was breathtaking. Any one of them alone could have held an audience spellbound; the ensemble was dazzling indeed." A former Heinz Foundation "Arts & Humanities Award" nominator for the prestigious "$250,000 Heinz Awards" that recognized Beverly Sills and Jon Harbison for their artistic excellence, Mr. McCully was also honored as a nominee of the "2000 Governor's Arts Awards" that "applauds his excellence in, encouragement and support of; and investment in the Arts in the Commonwealth of Virginia." The City of Alexandria honored James K. McCully at Schlesinger Concert Hall "for his exceptional contributions to enhancing the quality of artistic opportunities" as an "2005 Alex Award" nominee. At the "1st International Congress of Performing Arts Administrators" in London, Mr. McCully received an "Award of Excellence: for the Design of Complete Marketing Packages" from the International Society of Performing Arts Administrators, and was invited to speak on their panel on "Marketing the Arts to Future Generations" at the United Nations in New York City. As an educator, Mr. McCully has served on the voice faculties of the National Conservatory of Dramatic Arts and the Catholic University of America. His students are performing with Arena Stage, Baltimore Opera, Ford's Theatre, Kennedy Center, Metropolitan Opera, Signature Theatre, Virginia Opera, Washington Opera, Wolf Trap Opera, and on tour in major houses in Europe, North America, South America and Australia. As a lecturer, Mr. McCully has been a guest speaker with the International Institute of Education panel "The Role of Arts Management in the United States"; the United States Information Agency panel on "Funding the Arts, The Recipient's Point of View"; and the International Television Association panel on "Producing International Co-Productions" . Mr. McCully received his introduction into grand opera under the guidance and inspiration of world famous Metropolitan Opera soprano Marjorie Lawrence. 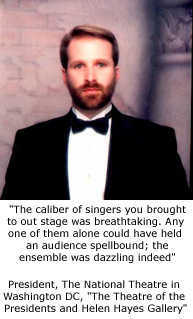 In addition, he studied vocal pedagogy with Dr. Thomas LoMonaco; coach/accompanying with Dr. Michael Cordovana; and with New England Conservatory of Music's Dr. John Moriarty as the production coordinator for the Central City Opera's RIGOLETTO, LA CENERENTOLA, THE STUDENT PRINCE, as well as, the AGMA Apprentice and Studio Artists Training Programs. In New York City, Mr. McCully successfully completed American Symphony Orchestra League's "General Managers Training Program" at Avery Fisher Hall, and performed a professional internship with Maryland Public Television's dynamic general manager Raymond K.K. Ho. Mr. McCully was educated at American University where he attended the graduate degree program in Arts Administration; and holds undergraduate degrees in Music, as well as, Radio, Television and Film degrees from the University of Arkansas. Mr. McCully served as a member of the Board of Trustees of the Source Theatre Company; and as a past president of Phi Mu Alpha Sinfonia Music Fraternity of America's Alumni Association in Washington DC. He is listed in several national and international publications including the Who's Who in American Music: Classical in New York City, and the International Who's Who in Music from Cambridge, England. Mr. McCully maintains a private studio in the greater metropolitan Washington DC area where he coaches, and prepares Emerging Artists for professional careers, showcasing them in concert in recognized concert halls, with nationally/internationally renowned established artists. Email Mr. McCully to schedule an audition for the Emerging Artists program, or to be considered for admission into his private studio in the greater metropolitan Washington DC area.